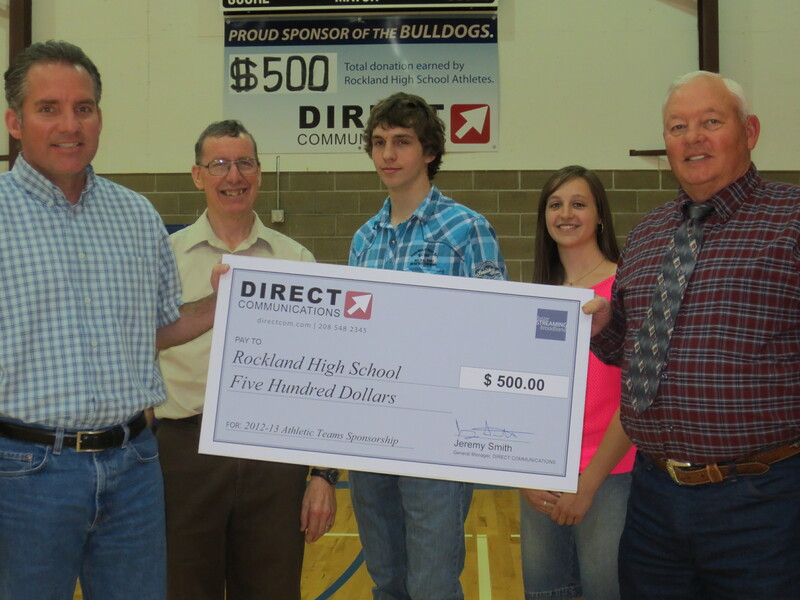 Direct Communications donated $500 to the Rockland High School Athletic Program this week as part of an effort to support local high school athletics in the communities served by the broadband company. At the start of the 2013 school year, Directcom approached each school athletic director, and offered a way for student athletes to earn donations for their school through their participation and effort in all varsity games. During football season, Direct Communications pledged to pay $15 for every touchdown at home games. At the same time the Girls Varsity Volleyball teams could earn $5 for each ace they served. Once basketball season started, varsity athletes could earn $5 for every 3-point shot scored during home games. During the 2012-2013 school year, Rockland Varsity teams reported a total of $150 in earnings through this sponsorship program. However, Direct Communications gave a final amount of $500, since they had pledged a donation of at least $500 to each school that participated . Jeremy Smith, General Manager for Direct Communications in Idaho, said he hoped the money would go towards the new Rockland School Weight Room, which is currently under construction inside the new school gym.